Rotary Club of Brantford-Sunrise is pleased to announce that we have selected our next Major Project for financial support! We will be giving $125,000 to Participation Support Services to purchase capital equipment needed to transform Stedman House into a permanent home for eight individuals with physical disabilities. The new residents are expected to move in this spring. Click on 'read more' for full story. 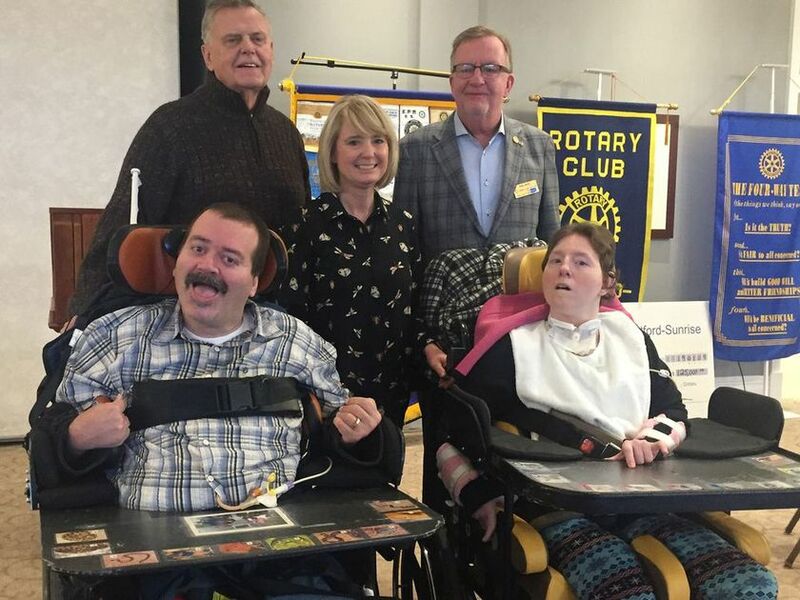 In picture: John Huigenbos (left), chair of the Participation Support Services board of directors, executive director Sherry Kerr and Phil Race, 2018-2019 President of the Rotary Club of Brantford – Sunrise with Andrew and Amanda Neilsen, who will be moving into Stedman House in the spring. We are pleased to announce that we have selected our next Major Project for financial support! We will be giving $125,000 to Participation Support Services to purchase capital equipment needed to transform Stedman House into a permanent home for eight individuals with physical disabilities. The new residents are expected to move in this spring. “Stedman House is a perfect, comfortable small home that suits the needs of individuals who require supportive housing,” said Sherry Kerr, executive director of Participation Support Services, which offers residential services at its site at 10 Bell Lane. Stedman House is the site of the Stedman Community Hospice, which opened in 2004. It has not been used as a residence since Hankinson House, the new home of the hospice, opened in September 2014 and is at St. Joseph’s Lifecare Centre. Once renovations are complete, Participation Support Services will lease the space as a permanent residence. For Participation Support Services, the move is a continuation of an effort to move people from the agency’s Bell Lane site to small group homes in the community. The agency is working to re-purpose the Bell Lane facility to a transitional bed program. At present, there are 23 people living in the Bell Lane facility, which is dated and looks more like an institution than a home. A non-profit charitable organization, Participation Support Services helps more than 350 people with either a physical disability, a complex health care need or who are senior citizens.